We propose a new fractional stochastic integer programming model for forestry revenue management. The model takes into account the main sources of uncertainties—wood prices and tree growth—and maximizes a reliability-to-stability revenue ratio that reflects two major goals pursued by forest owners. The model includes a joint chance constraint with multirow random technology matrix to account for reliability and a joint integrated chance constraint to account for stability. We propose a reformulation framework to obtain an equivalent mixed-integer linear programming formulation amenable to a numerical solution. We use a Boolean modeling framework to reformulate the chance constraint and a series of linearization techniques to handle the nonlinearities due to the joint integrated chance constraint, the fractional objective function, and the bilinear terms. 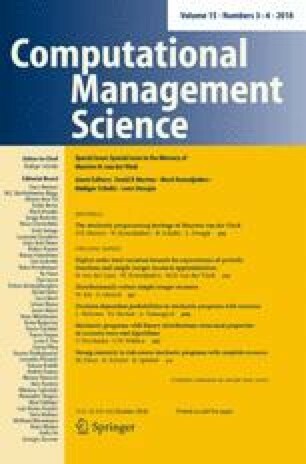 The computational study attests that the reformulation of the model can handle large number of scenarios and can be solved efficiently for sizable forest harvesting problems. Dedicated to the memory of Maarten van der Vlerk. We are grateful to Mikko Kurttila and the Finnish Forest Research Institute for providing the data used in this paper and for providing insightful suggestions about the models and the analysis of their results. M. Lejeune was partially supported by the Office of Naval Research, Grant #N000141712420.